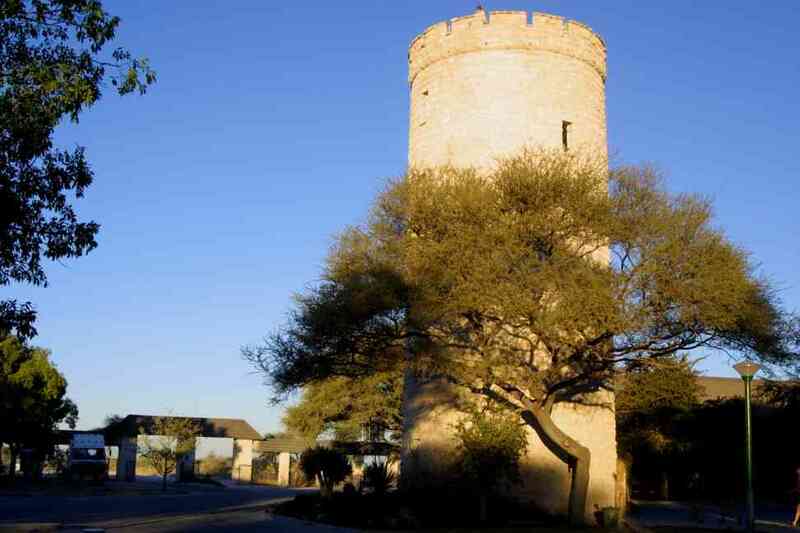 Namibia possesses an excellent network of roads that criss-cross the country, much of which is manageable with a 4x2 vehicle (less Damarland, Kaokoland and eastern Caprivi). That said, many are gravel graded roads that shook Daph hard due to the vicious corrugations and the rain at Sossusvlei demanded a 4x4 to reach the final stretch. We used the Contimap which was accurate, up to a point. We found it frustrating to have no relief depicted on the map and distances were sometimes inaccurate. 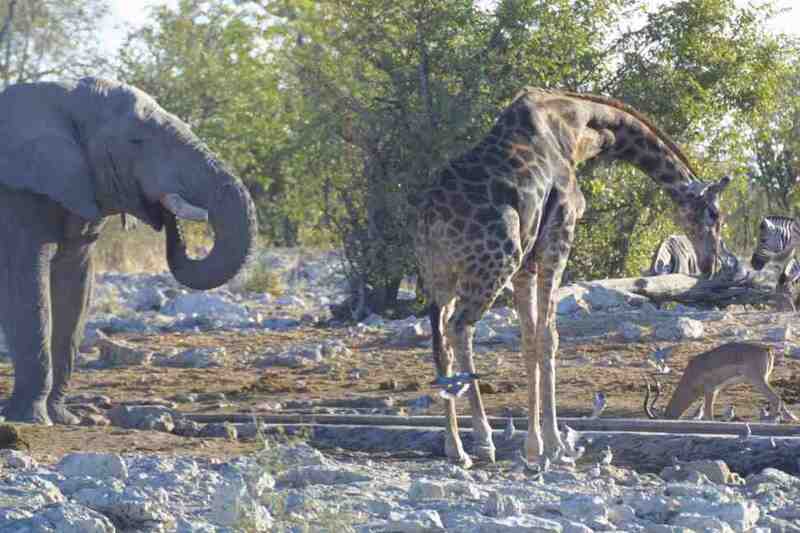 Equally the recent explosion in tourisom within Namibia meant the lodge and camping information was dated. This is harsh criticism for we never had to resort to GPS, for which the maps are designed. 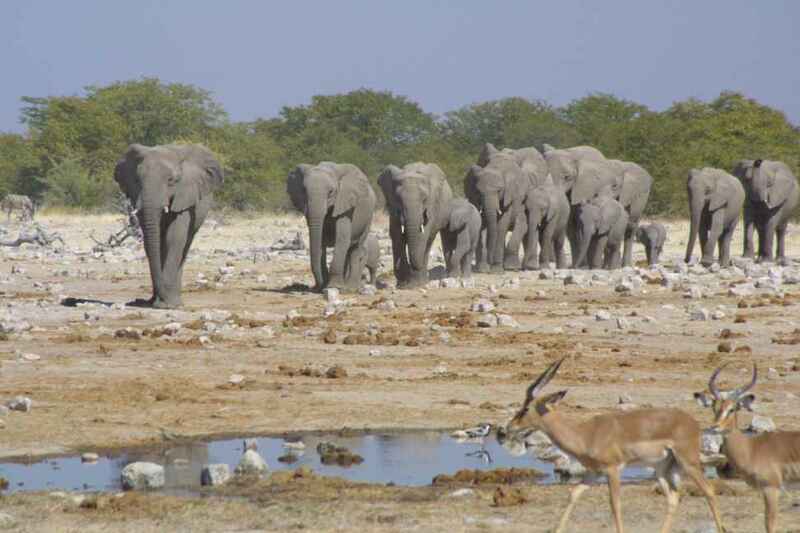 Although we visted the main tourist sites, we had planned to be more adventurous within the 4x4 areas of Damaraland and Kaokoland, that are reputed to be the most facinating and interesting areas within Namibia. 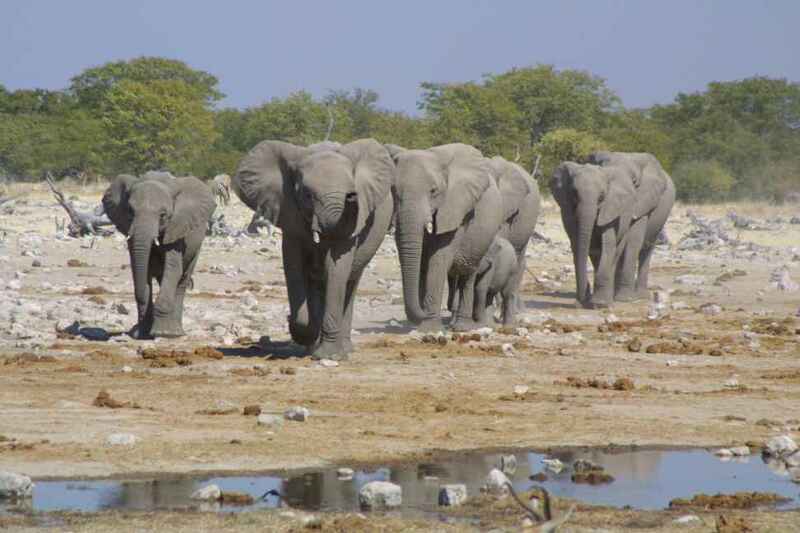 Sadly to to our accident and catherines sore shoulder, we have modified our plans and these areas will have to wait for our next visit to watch the Damara Desert elephants! We reached the Namib border at 1000hrs on 10 June. The girl in customs on the South African side took some time with carnet and decided to take off import (first perforation) as well as export (second one). She stamped import and export on the counterfoil, as well as stamping the receipts we produced for VAT refund, but said we couldn’t claim for anything on the vehicle you couldn’t see – eg parts for the engine! All the literature we had read and significantly within the leaflet from the AA, each state that the police clearance form (for Daph) had to be obtained at the border post. 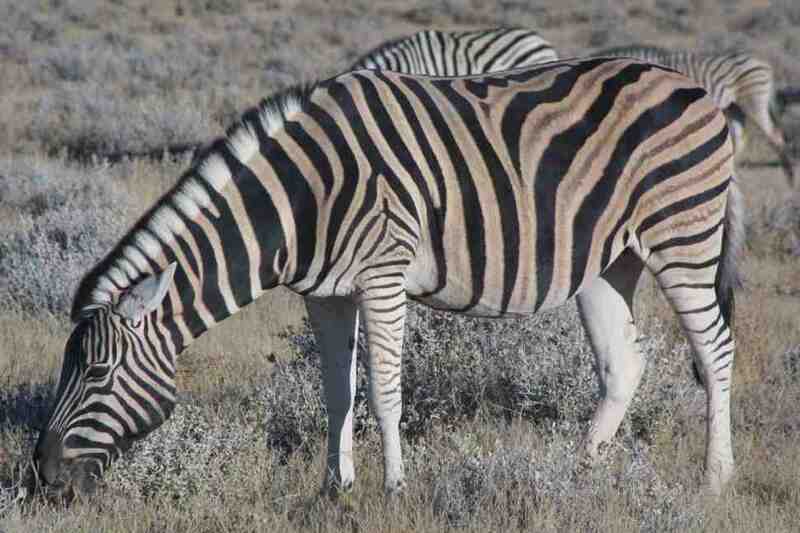 But when we gave the customs girl the tax invoice for the car, we were told we had to go back to Springbok (120km!) to get a police clearance form in order to claim VAT on the vehicle. This represents a large amount of VAT (R15,000). It seemed we were destined to never leave South Africa, for after the debate and we decided to go back to Springbok, the girl phoned the police and was told that we did not need this form as we clearly owned the car – we were on the computer. The VAT man then said we would have to get the police clearance form for a VAT refund. She called the police again and said we would have to go. We asked if the form could be faxed but she said she needed to stamp the original form which had little flags around it! The girl was adamant that the police at the border could not do this. 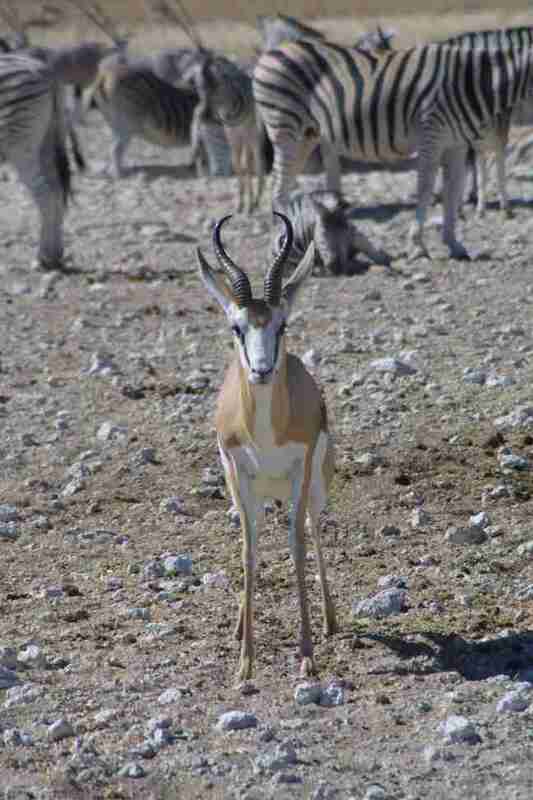 So, at 1030 hrs we drove to Springbok. We got there at 1145hrs, and the police said we had to go to the Municipal Offices to get something called an RPC import form before they could issue the clearance form. The woman in the Municipal Office was not very helpful and told us we would have to be patient as the computer was not working so she could not print out the form we needed – it had to be personalised with Daph’s details. So we waited 10 mins, and all of a sudden the form was produced. We took it to the police station and the inspector took us into his office. He had lost the key to his filing cabinet, so he opened it by sliding a large hunting knife down the side. He entered the details from the RPC form onto the computer, and then wrote out the police clearance form, using a carbon paper copy. The form did in fact have coloured flags all round the edge. 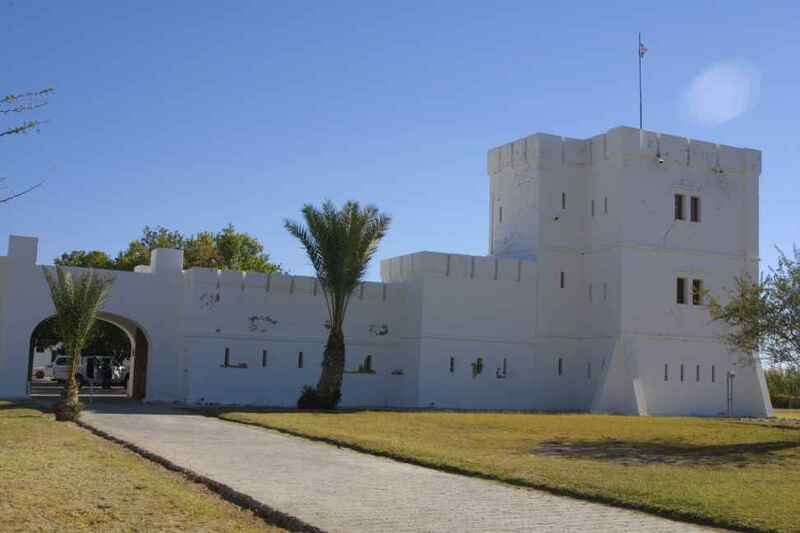 Unfortunately, he wrote the destination country as Namibia, though we are intending to go back to the UK. We had lunch before the drive back, and reached the border for the second time at 1450hrs. By this time we were practically on first name terms with all the police and border staff – all of whom were still on duty. The girl duly stamped our police clearance form, and then we took the VAT invoices to the VAT claims refund man. It was a much less painful process than the Botswana border last year! He gave us a package of forms to send back to South Africa when we registered the vehicle in the UK, and then the VAT on the car would be sent back. He noticed that the invoice from B’rakhah was out of date – 20 Feb and you can only claim within 3 months. Adrian explained about the accident and our enforced stay in RSA – otherwise we would have been in time. He gave us another envelope and told us to write to the South African tax people and explain and we might get our money back. 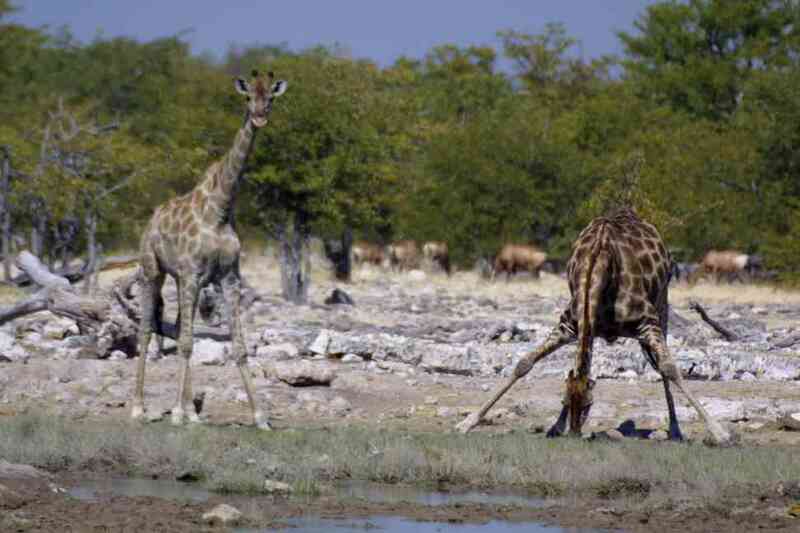 He was quite sympathetic – perhaps as he knew we had been back to Springbok. At the Namibian side of the border, the girl had some trouble with the carnet so in the end we did not give her the clearance form, in case it delayed us further. 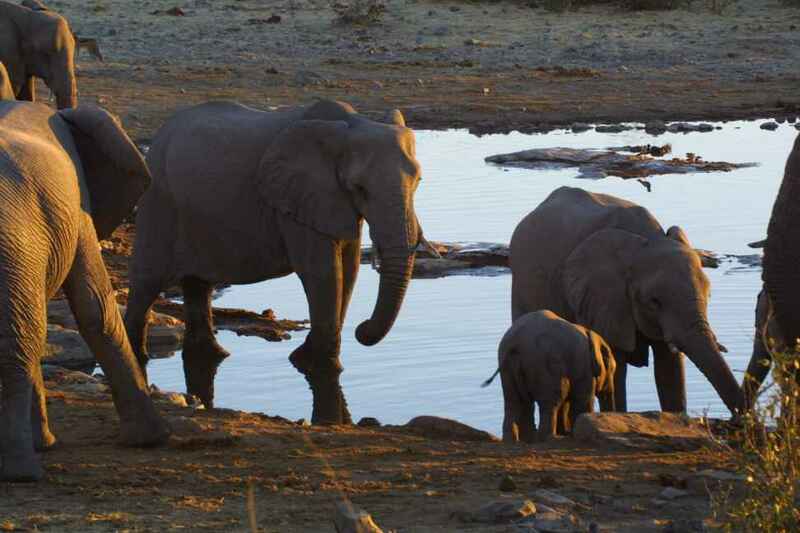 Then we were away, with a 14 day permit in our passports to stay in Namibia. 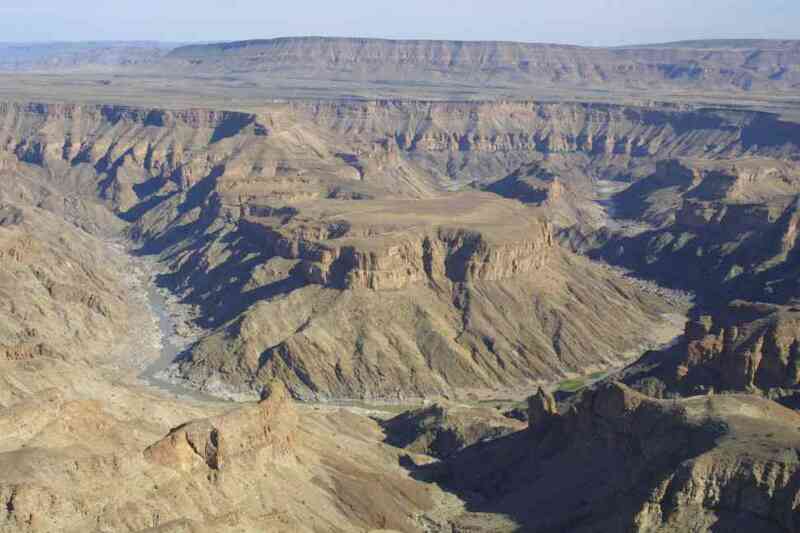 The Fish River feeds the Orange River at the border, but flows through its own canyon first, which is some 160km long and up to 27km wide. Resulting from both geological faulting and secondary river erosion, the Canyon is quite dramatic. The photo shows the classic view from Hobas, although we did not camp here. We stayed at Ai Ais sulphur springs, and spend an hour or so in the evening relaxing in the water – which was very warm and extremely buoyant – so much so that we felt extremely heavy when we got out of the pool. 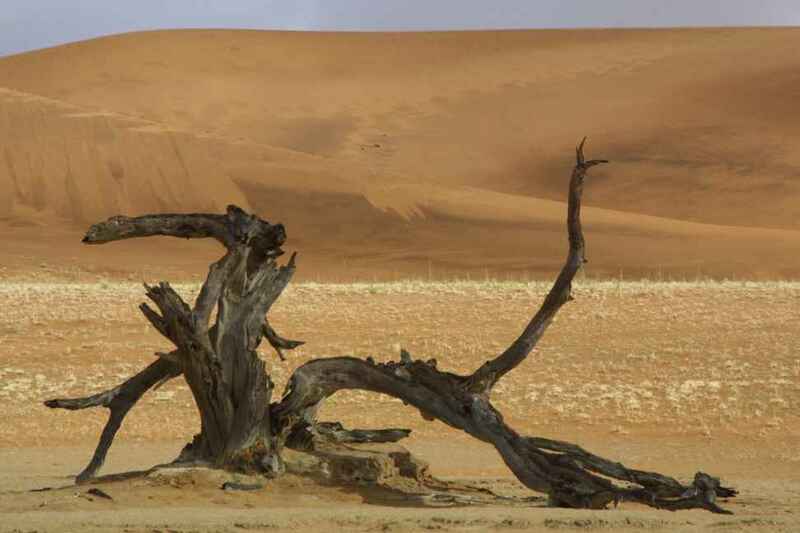 Sossusvlei is the most accessible part of the sand-sea dunes that stretch 300km along the coast and nearly 150 km inland covering over 32,000 sq km of western Namibia. 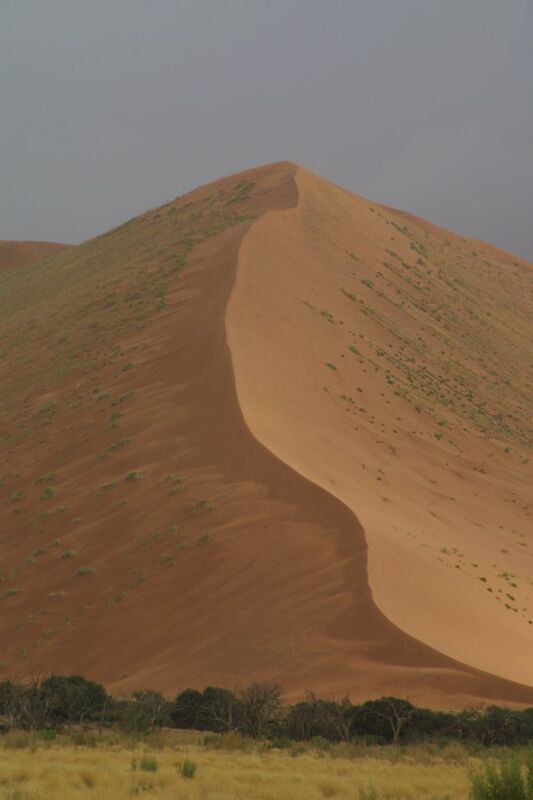 It is estimated that these dunes are growing by over 400,000 cubic metres annually. The sand is thought to have originated from the Kalahari around 3-5 million years ago. Geological activity washed the sand down the Orange River where it was subsequently swept up the Namib coast on the Benguela current. 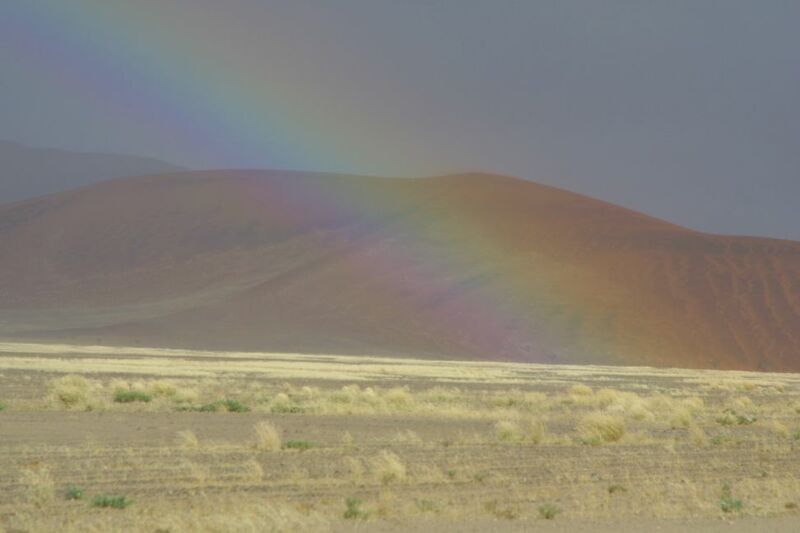 When we reached Seseriem it was cloudy, having rained in the night, though there were patches of blue sky. We drove the 50 km road to Sossusvlei with dunes on either side, saw the famous Dune 45 (so called as it is 45km from Sesereim) and went on to the first parking area, which is at Sossusvlei itself. Only 4x4s were allowed to go further. It was raining, and puddles of mud were forming in the sand. We reached a second car park, after driving through thick sand, and then walked the 1.1km to Dead Vlei. It was heavy going in the soggy sand, though probably easier than walking in dry sand, for the route was over several small dunes. The floor of Dead Vlei was made up of tiles of thick clay, which was like round flagstones in appearance. 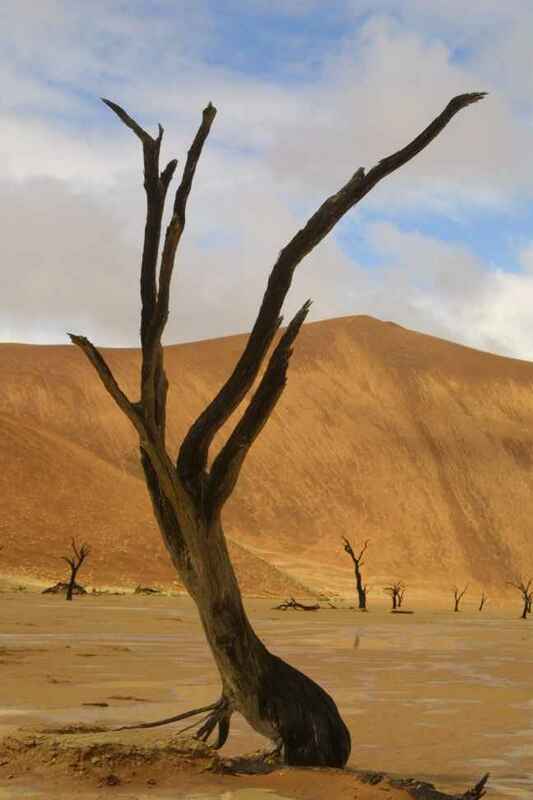 The former lake bed contained trees which were 900 years old, and had been fossilised as there were no insects or anything in the atmosphere to make them decay. 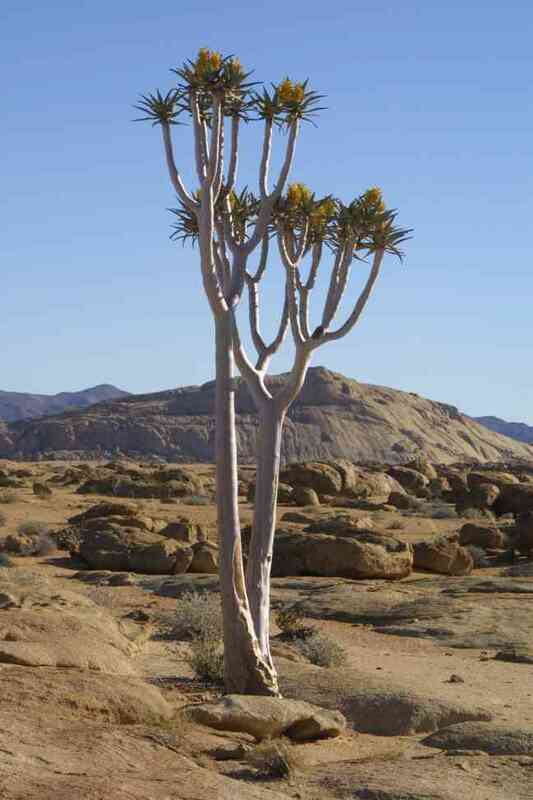 This park lies within the northern Namib desert, which is the oldest and driest desert in the world. The Naukluft Mountains are characterised by a high plateau bisected by gorges and sandy plains. 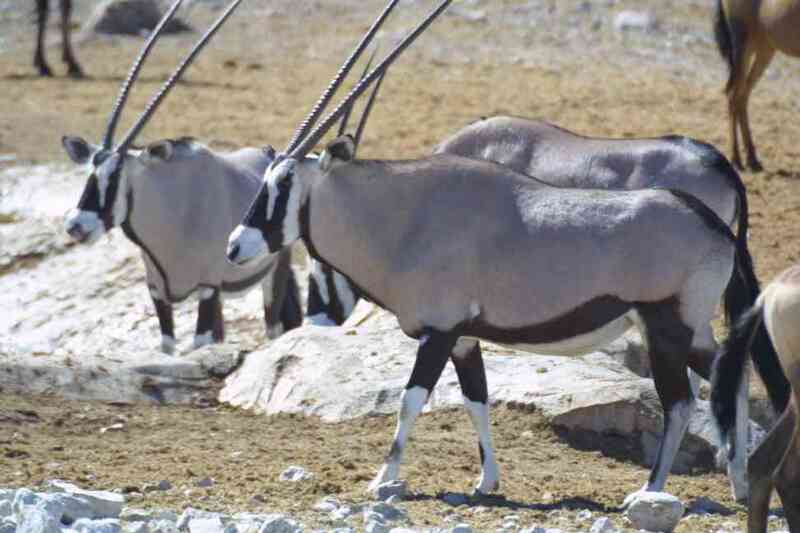 The park supports oryx, springbok and the ancient welwitschia plant whose only source of moisture is dew and fog. 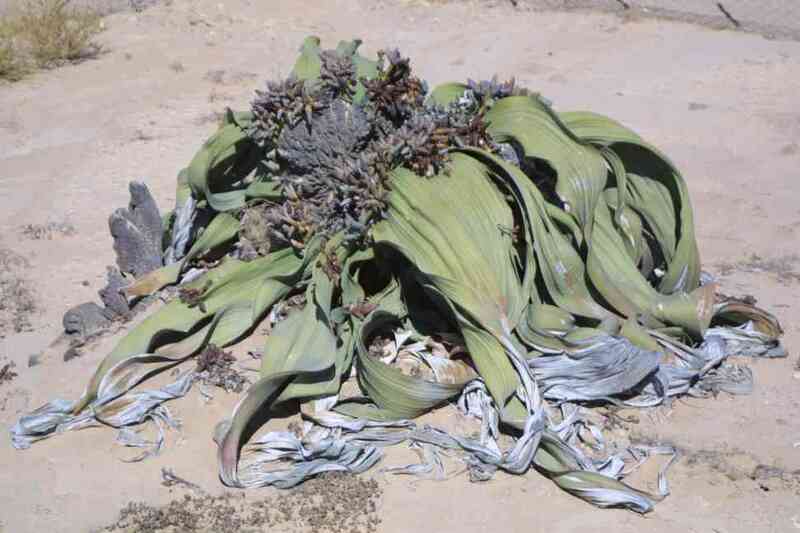 These plants are extremely rare, and that pictured is over 1,500 years old. The desert plains are punctuated by dramatic rock outcrops and isslebergs, like Bloedkoppie, the Naukluft's own version of Ayres Rock! AfriCat is a non-profit organisation which works to try to resolve the conflict between farmers in Namibia and large carnivores. The Foundation achieves this by working closely with farmers to assist them with problem predators, through the education of young people about large carnivores and awareness of the environment. 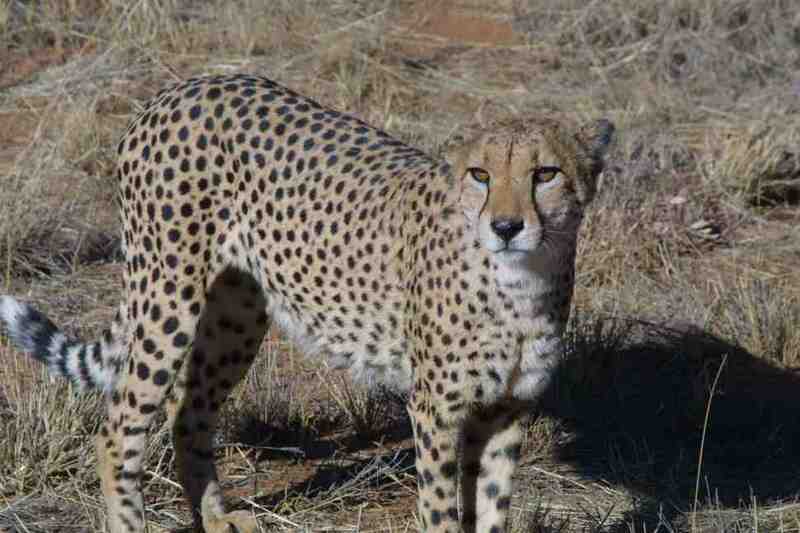 This is backed up by ongoing research on cheetahs, leopards, brown hyenas and lions. 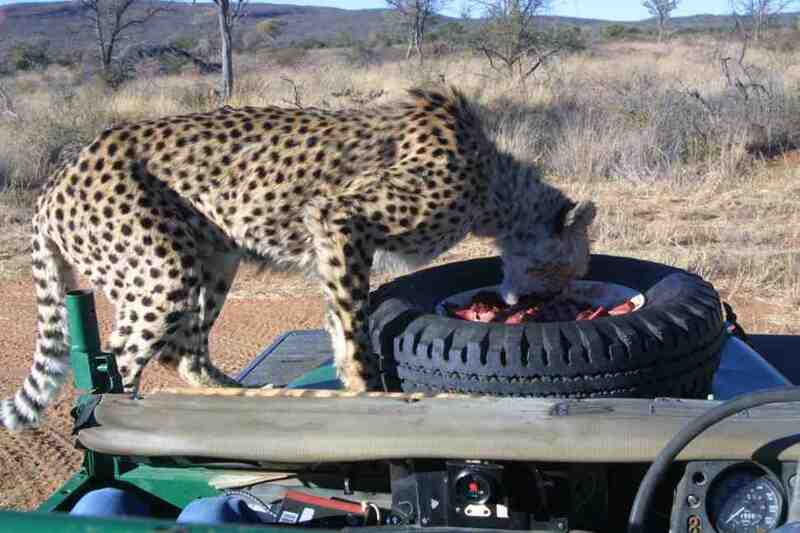 After being shown to our room at Main Camp, we met the other guests for tea and cake at 1500hrs. Then we drove out into the 4000 hectare area which is sponsored by the Tusk Trust, to enable AfriCat to create a game park and home for the carnivores. 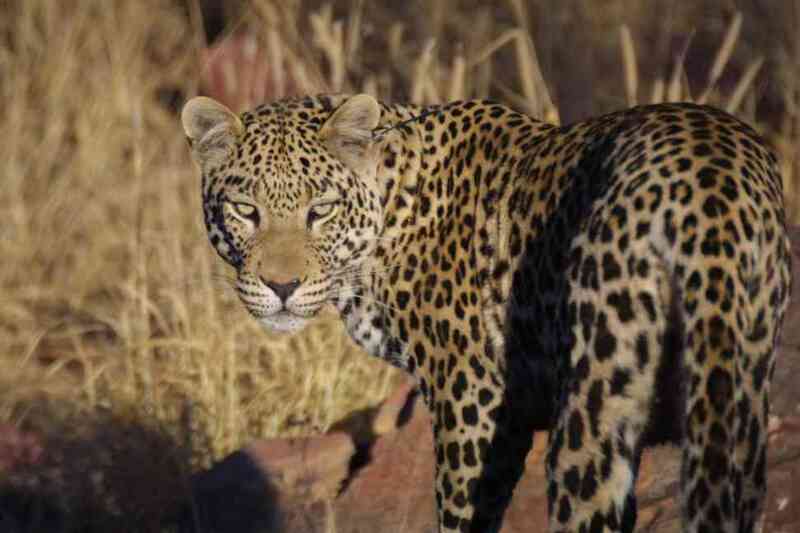 Our guide, Andreas, showed us the distinctive prints of both leopard and cheetah, and he tuned in to see whether he could locate the leopards by their have radio collars. There was a strong signal from one of the males, plus some tracks, so we followed them and then walked up an embankment. 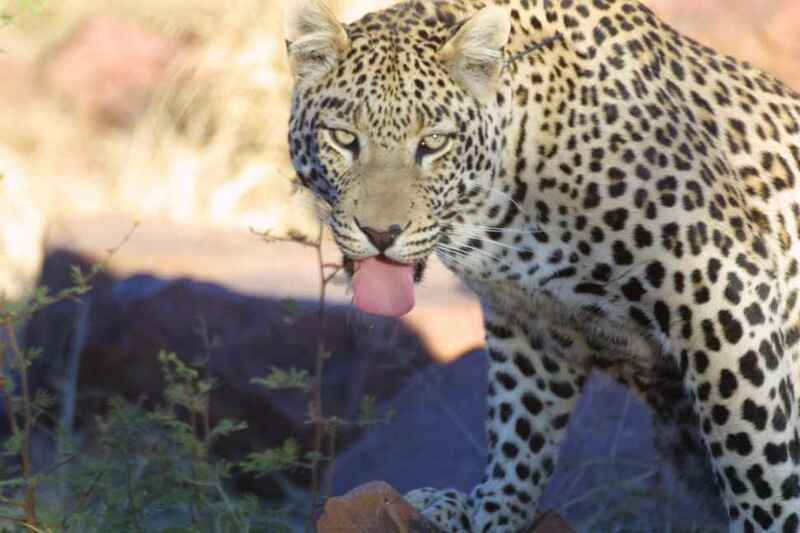 The view into the neighbouring farm was fabulous, and though we did not see the leopard, Andreas said that he was somewhere close, along the boundary fence. 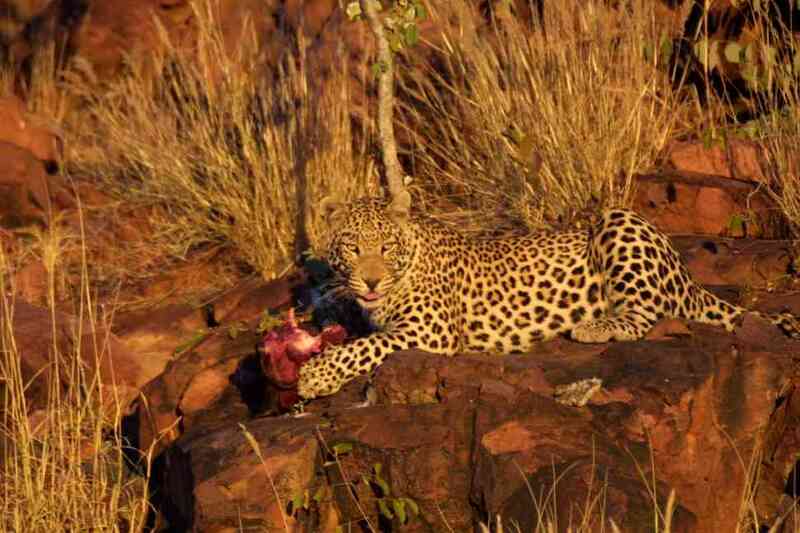 We were then driven to the “dinner table” of the leopards, and sat in a hide while the rangers provided meat for the leopards. While we were watching the male eat, we heard growling from behind the hide. 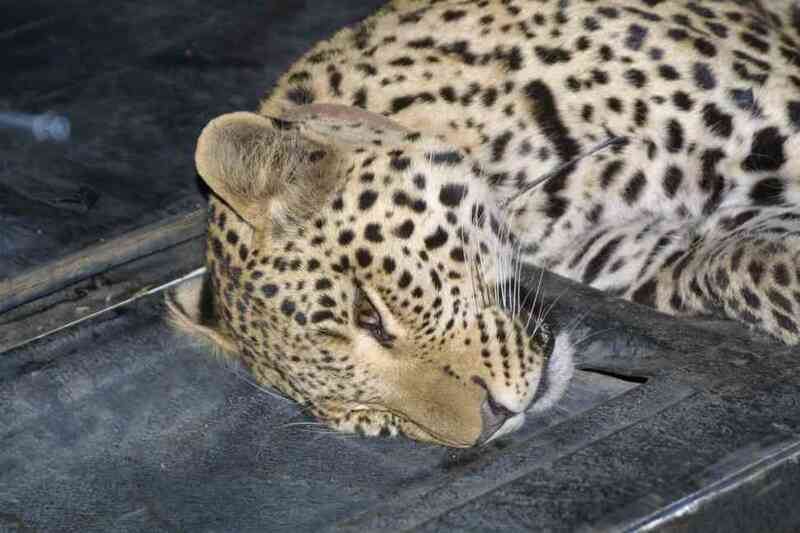 This was MJ, the female, who had been darted in order for her radio collar to be enlarged. We were allowed to touch her whilst she slept – her fur was extremely soft and velvety. Her retractable claws were very sharp, and some still had blood on them from the meat which had been used to tempt her into the cage. Dave, a qualified representative from AfriCat (and apparently a wildlife filmmaker! ), injected her with a microchip for identification, and administered a contraceptive injection under the skin of her neck. This will last for one year, and is necessary as she is now 18 months old, and ready to have cubs, but the area will not support more cubs at this time. Then he loosened her collar, making sure that she would not be able to pull it off herself or get her jaw caught in it. The following day was spent at the AfriCat organisation, learning about their projects and visiting the orphaned and hand reared cats that cannot be released into the wild for they have become too dependent on humans and would not survive. 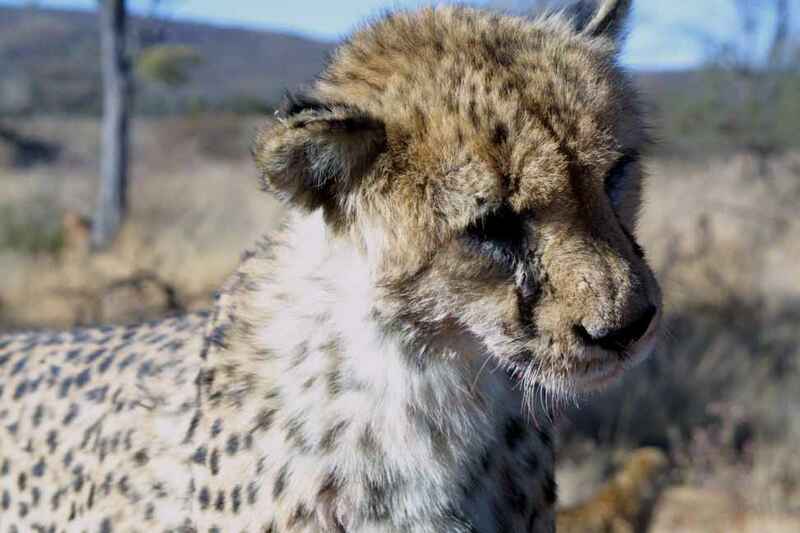 We went into the area of bush where 7 orphan cheetah lived, in order to find and feed these animals. 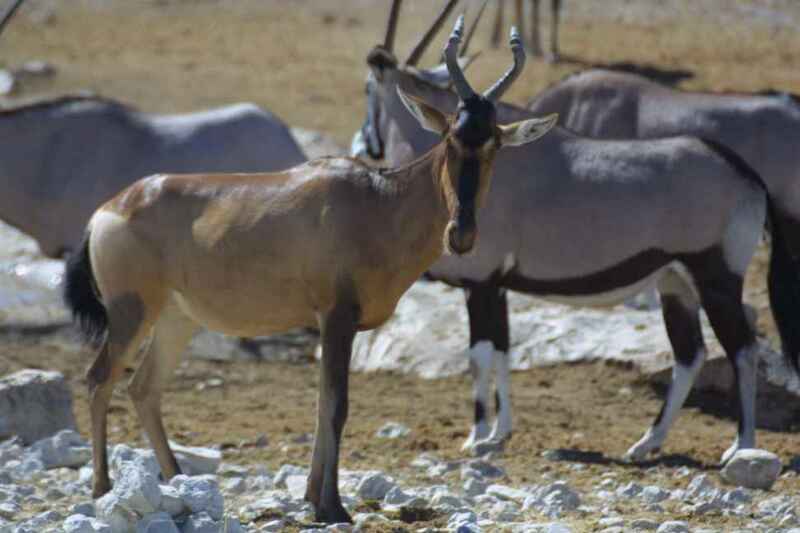 It was a wonderful experience to be so close to these animals. 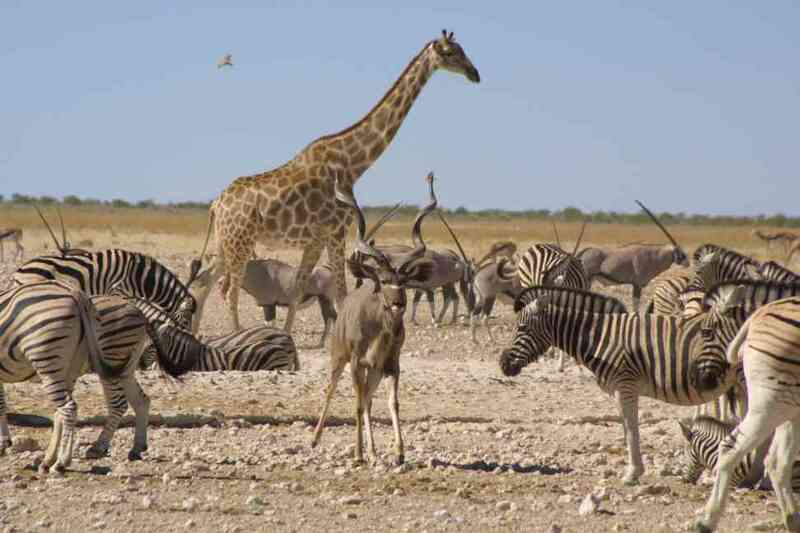 Etosha, which means 'great white place of dry water', refers to the vast greenish-white Etosha pan - an emense flat saline desert. The main pan covers an area 120km at its longest and 72km at its widests there are numerous satelite pans within the park. 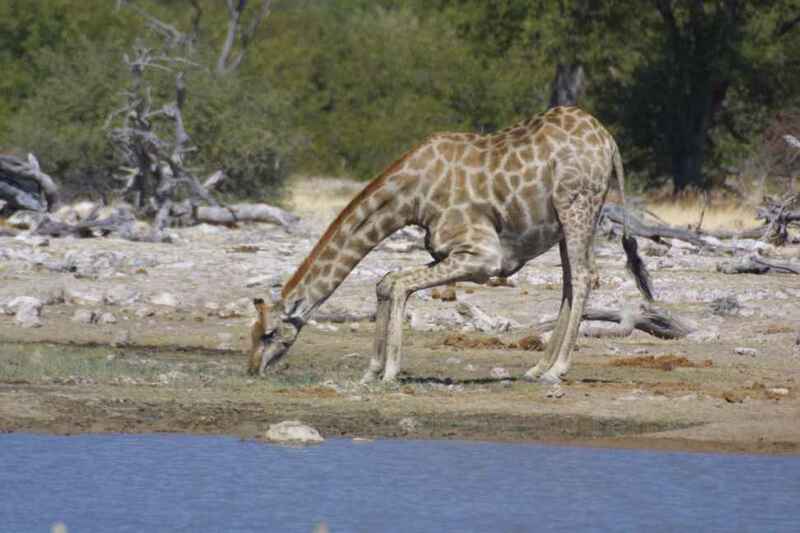 The park of 22,270 sq km and is one of the largest game parks in Africa. The salinity of the water is almost twice that of sea water. 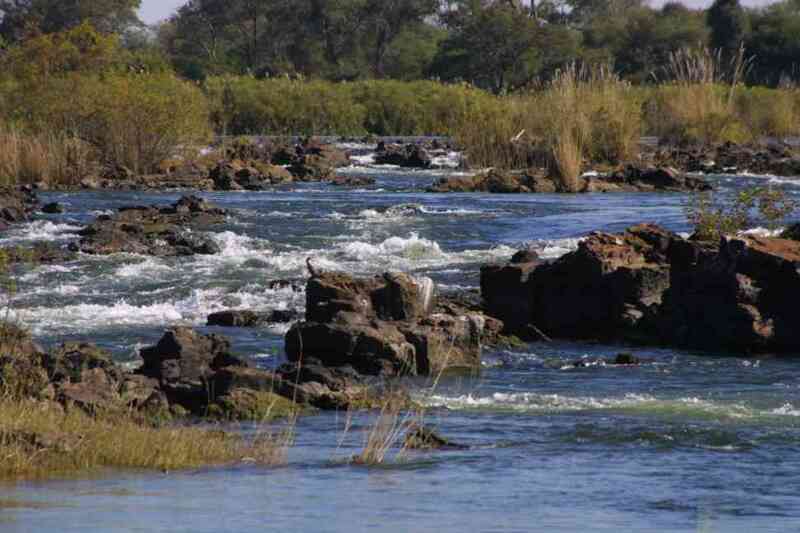 Equally there are many artesian and contact springs which support a rich diversity of flora and fauna. 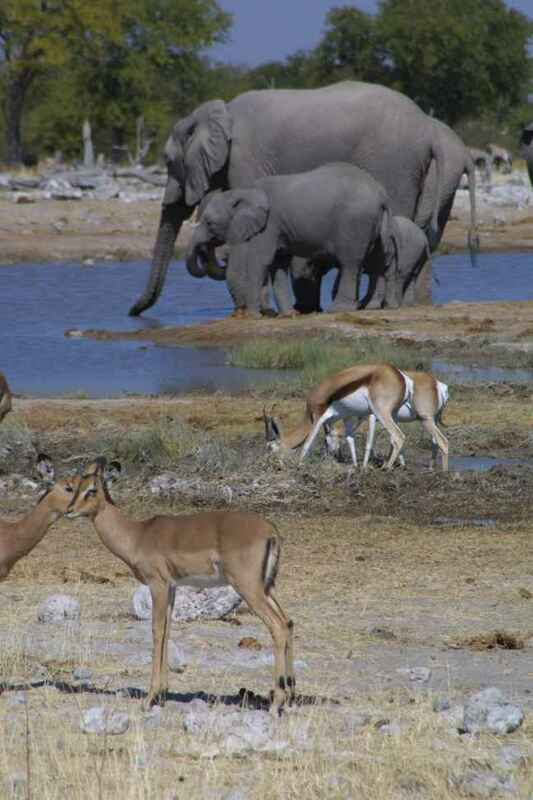 Most of the big five can be seen (less buffalo) and there is a profusion of ungulates and bird life to see. 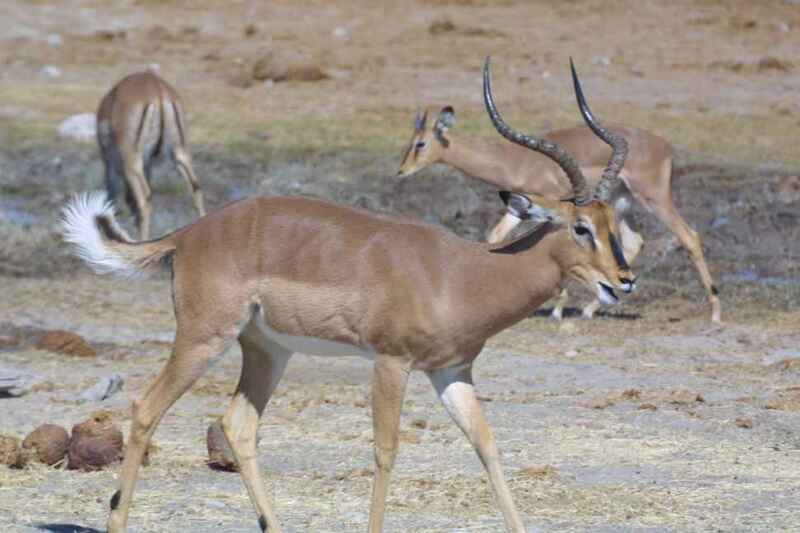 Notably there is the black-faced impala and the Damara dik dik (Africa's smallest antelope) that are rearly seen elsewhere. Our last night in Namibia was spent at Popa Falls. By the time we arrived the campsite was fairly full, and all the grassy spots were taken. We had some South African rand left (we used rand all the way through Nambia as the exchange between rand and Namib dollars is 1:1, and rand are accepted everywhere) so we rented a small chalet, with a kettle and fridge. This gave us a chance to re-charge some of our electrical items. There was a toilet block with hot showers, and a block with 3 electric cookers, sinks for washing up and an ironing area. The chalet was thatched with a high roof and there were a few insects about, but we both slept well on our wooden beds with duvets and woollen blankets. Popa Falls was described as "mildly interesting" by Lonely Planet. We enjoyed the peaceful atmosphere, but would not have gone out of our way to see the falls, though admittedly they were not at high water when we were there. We used the ContiMap of Namibia, sufficiently detailed for travelling by road, although the time and distance estimations varied considerably. We did not need to use GPS for this part of the journey, as the signposting etc was accurate.